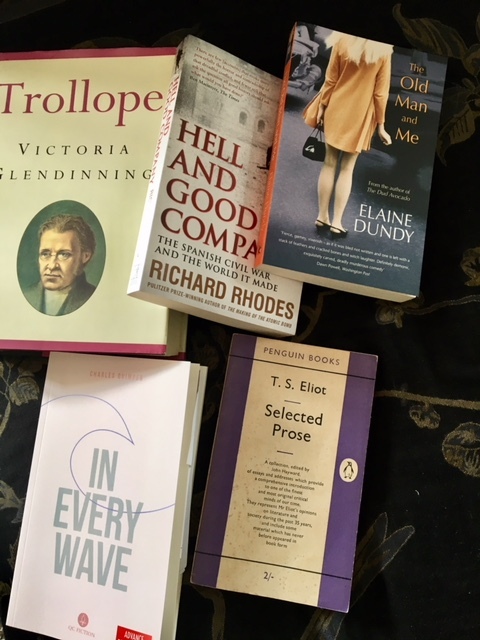 This entry was posted in Asides and tagged Charles Quimper In Every Wave, Elaine Dundy The Old Man and Me, QC Fiction, Richard Rhodes Hell and Good Company, T.S. Eliot Selected Prose, Victoria Glendinning Anthony Trollope by Simon Lavery. Bookmark the permalink. Essential purchases, all! Have a wonderful trip, Simon! Thanks, Karen. Part of it is grandparental duties, but we’ll have a grown-up day and night in Barcelona on our own! I hope you enjoy your trip, Simon. Many thanks for the link to my Dundy piece – that’s very kind of you. I’ll be interested to hear what you think of The Old Man and Me, as and when. Apologies if I’ve asked you this before, but have you read Carmen Laforet’s novel, Nada? It captures the bruising fallout from the Spanish Civil War to excellent effect. A good one to consider if you’re ever looking for more books connected to the local area – that is if you haven’t read it already. Thanks, Jacqui – and you’re most welcome. I know of the Laforet novel, but no, haven’t read it. I suppose the list of Spanish Civil War fiction is huge (I’m not too keen on Hemingway’s efforts about it, but they have their merits); I read MANY years ago the first in the Forge trilogy by Arturo Barea – set mostly in Madrid, I think I recall, rather than the usual Barcelona or Catalonia. And of course there’s poetry and art, too. I’m sure I’ll get to the Laforet at some point. I lived in the Basque country of Spain for almost a year some time ago, and studied Spanish to A Level, so have always taken an interest in its history and culture. Don Quixote is a high point in western art. Packing or Trollope, hm … Have a lovely time away! I’m already mentally packing for our trip in October (just the books, you understand) but need to read a fat tome on the history and archaeology of the Isles of Scilly BEFORE we go! It’s in the house, just needs to be sat down with. It’s quite a big one with lots of illustrations, so a nestling on the sofa job, I think. I have In Every Wave as well, and while I have only read the first five pages or so, it seems exquisitely heartbreaking. I can feel the father’s pain, and put myself in his place, all too easily. Belleza: I’ll be interested to see your thoughts when you finish. Sorry for the delay with your comments: I’m in Spain visiting family and don’t check mail so often – and am experiencing problems with WiFi. Thanks for dropping by and taking the trouble to make the comment – it’s always good to hear from you.